Ray Tanguay, the automotive advisor to the governments of Canada and Ontario, speaks at the North American International Auto Show in Detroit. DETROIT -- Ray Tanguay has a warning for the auto industry and the federal and Ontario governments as the likes of Apple, Google and Uber increasingly compete with automakers: We’re not too big to fail. 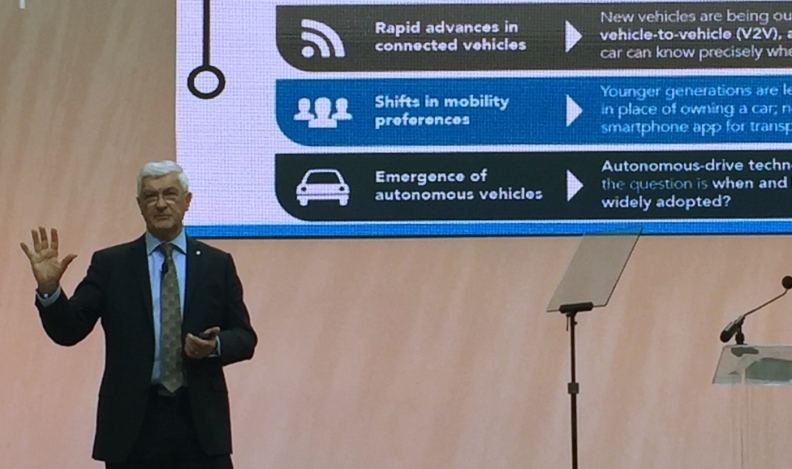 The automotive adviser to the governments of Canada and Ontario delivered the message during a keynote address Jan. 14 as the North American International Auto Show opened to members of the media. Prior to being named Canada’s “auto czar,” Tanguay, 67, had been chairman and president of Toyota Canada. He retired from the automaker in March 2015 and started his new job about three months later. Tanguay said technology is moving fast but that automakers — and governments — aren’t necessarily keeping pace. Today, millions of people have high-speed internet and carry smartphones — essentially mini versions of personal computers — in their pockets. Tanguay said 170 companies in Ontario alone are developing artificial intelligence, a key to autonomous vehicles. Tanguay said Google, Apple, Uber, Magna and others invested more than $1 billion in artificial intelligence research in Ontario in 2017. “There’s going to be much more pressure” on automakers from the likes of Silicon Valley, Tanguay warned. The state already has MCity, a 13-hectare (32-acre) simulated city at the University of Michigan in Ann Arbor. It is also constructing Planet M, hailed as America’s first full-scale connected and autonomous vehicle testing site. Ontario did open an autonomous vehicle demonstration and testing zone in Stratford in November 2017. The Autonomous Vehicle Innovation Network is among the first of its kind in Canada and will allow researchers to hone the technology and test an autonomous vehicle in a wide range of everyday, real-life traffic scenarios. Tanguay said Michigan and Ontario need to join forces to form a beachhead against Silicon Valley’s surge into the auto industry and the way in which it purges talent from the province and state. Since Tanguay became a government adviser, Ontario and Michigan signed a memorandum of understanding to jointly promote innovation and regional competitiveness in the auto industry. In August 2017, Canadian parts giant Magna International and fellow supplier Continental took two autonomous vehicles on a 500-kilometre cross-border trip during which drivers had their hands off the wheel 92 per cent of the time. “We will collaborate to share technology, collaborate on how to strengthen the industry and we will collaborate on how to develop talent,” Tanguay said. Ontario is the second-largest IT region in North America, and Tanguay says the provincial government has a goal of annually graduating 1,000 people with applied masters in artificial intelligence and increasing the number of STEM grads to 50,000 from 40,000. “If we want to compete with Silicon Valley, we have to stop developing the talent that’s going to go to Silicon Valley. How do we support the startup companies? How do we invest in local companies?” he told reporters after his address. Tanguay said one of the way for Ontario’s auto sector to compete is to form partnerships with universities and automakers.